I am going to take this Famous Food Friday to namedrop. No, I do not know George Orwell, but I am friends with Christopher Hitchens who has often written about Orwell. In fact, Christopher Hitchens is often credited with inspiring a kind of “Orwell Revival” as it were. Though for, some of us, the revival was preaching to the choir. 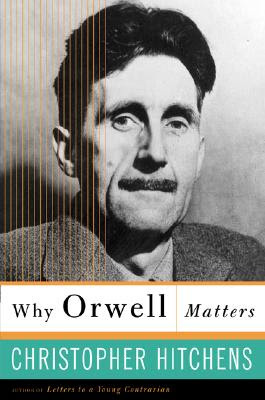 Still anyone who fosters a further reading of Orwell is peaches in my book. Now let me clarify: When I say Christopher Hitchens and I are friend, I don’t mean in that -- Graydon-Carter-and-I-are-headed-to-the-Waverly-Inn-do-you-want-to-join-us-for-lunch -- way, but more in the way that we would say hello if meeting on the street. 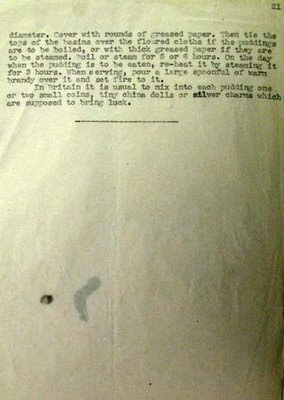 About a year ago, I was doing some research and ran across an unpublished essay of Orwell’s entitled British Cookery. It was complete with several recipes and I was totally enamored. It was one of those moments you really wanted to share with someone. 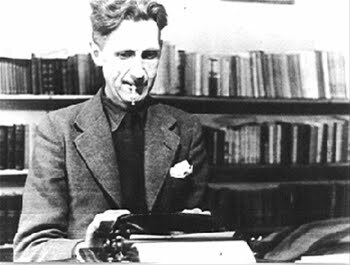 (Yes, people, finding an obscure, unpublished essay by George Orwell is definitely a Hallmark moment for many of us. The card would say: Reading Orwell and Thinking of You – Keep The Aspidistra Flying!) Alas, I had no one to share it with. Several weeks later I was to see Mr. Hitchens and I made him a copy of the article. When I saw him I handed him the article and he promptly left the room. I was undaunted by this behavior and rightly so. A few minutes later, he returned bearing a large book. For one of his speaking engagements, he was given a multi-volume hardback collection purporting to be EVERYTHING that George Orwell ever wrote. He had ducked out to check this collection to make sure that British Cookery was included. It was and all was well. For Penguin’s 70th birthday, they published works from 70 of their authors for 70p. One of these titles was a collection of Orwell essays featuring In Defense of English Cooking. Had I been the editor, I would have compiled all or Orwell’s writing about food into a single volume. It would be scant but very interesting. After all, In Defense of English Cooking has nary a recipe included just the best of English cookery. "We have heard a good deal of talk in recent years about the desirability of attracting foreign tourists to this country. It is well known that England’s two worst faults, from a foreign visitor’s point of view, are the gloom of our Sundays and the difficulty of buying a drink. Both of these are due of fanatical minorities who will need a lot of quelling, including extensive legislation. But there is one point on which public opinion could bring about a rapid change for the better: I mean cooking. It is commonly said, even by the English themselves, that English cooking is the worst in the world. 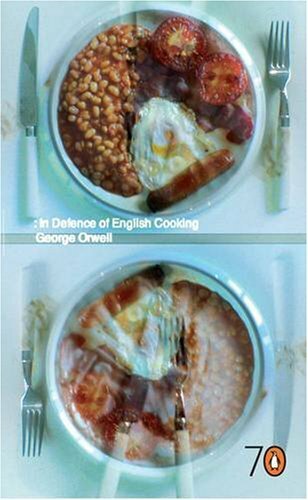 It is supposed to be not merely incompetent, but also imitative, and I even read quite recently, in a book by a French writer, the remark: ‘The best English cooking is, of course, simply French cooking.’"
Nonsense says Orwell. His list of British culinary accomplishments are vast. There is bread sauce, horse-radish sauce, mint sauce and apple sauce along with redcurrant jelly. Sweet pickles which are he says, "in greater profusion than most countries." All the bread is good. Stilton cheese and Cox’s Orange Pippin apple would go great with the bread. "When Voltaire made his often-quoted statement that the country of Britain has “a hundred religions and only one sauce”, he was saying something which was untrue and which is equally untrue today, but which might still be echoed in good faith by a foreign visitor who made only a brief stay and drew his impressions from hotels and restaurants." It ends with a flurry of recipes for British culinary favorites, including an orange marmalade that Orwell cites as a bad recipe with too much sugar. It is nice to know he cooked his recipes before publishing them, or attempting to publish them. I am sorry, after the Voltaire quote, that Orwell did not include his recipes for sauces that he speaks so highly of in The Defence of English Cooking. We will have to settle for puddings. Here are two examples (one savory, one sweet) from British Cookery and the recipes to go with them. "Most characteristic of all is roast beef, and of all the cuts of beef, the sirloin is the best. It is always roasted lightly enough to be red in the middle: pork and mutton are roasted more thoroughly. Beef is carved in wafer-thin slices, mutton in thick slices. With beef there nearly always goes Yorkshire pudding, which is a sort of crisp pancake made of milk flour and eggs and which is delicious when sodden with gravy." "Far and away the best of all suet puddings is plum pudding, which is an extremely rich, elaborate and expensive dish, and is eaten by everyone in Britain at Christmas time, though not often at other times of the year." 1/8 of a pint of brandy, or a little beer. Wash the fruit. 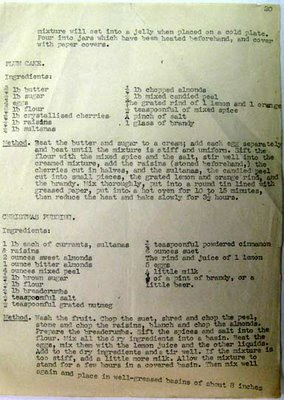 Chop the suet, shred and chop the peel, stone and chop the raisins, blanch and chop the almonds. Prepare the breadcrumbs. Sift the spices and salt into the flour. Mix all the dry ingredients into a basin. Beat the eggs, mix them with the lemon juice and the other liquids. Add to the dry ingredients and stir well. If the mixture is too stiff, add a little more milk. Allow the mixture to stand for a few hours in a covered basin. Then mix well again and place in well-greased basins of about 8 inches diameter. Cover with rounds of greased paper. Then tie the tops of the basins over [with] the floured cloths if the puddings are to be boiled, or with thick greased paper if they are to be steamed. Boil or steam them for 5 or 6 hours. On the day when the pudding is to be eaten, re-heat it by steaming it for 3 hours. When serving, pour a large spoonful of warm brandy over it and set fire to it. In addition to these essays, Orwell wrote a lovely piece on tea. A Nice Cup of Tea outlines Orwell's eleven rules of making tea. (Read Christopher Hitchens' article on making tea the Orwell way, here.) In Moon Under Water, Orwell waxes poetic about his favorite public-house, or pub, discussing its decor, its beer and its food. How nice would it have been if Penguin had collected all these essays into a single volume. Hope You Are Feeling Better -- Keep the Aspidistra Flying! P.P.S. Keep the Aspidistra Flying is a rather dismal book to have such a zippy title. I am not suggesting you read it, but it is an excellent charades clue. Nice piece. You say you don't know Orwell. Well, it's entirely understandable. He died in 1950.